Early September showers offered some reprieve to some South Dakota ranchers, and according to the USDA's most recent crop progress report, 37 percent of pastures in the state are rated "good" or "excellent." Meanwhile, the report indicated that 67 percent of stock water supplies are considered at adequate or surplus levels. 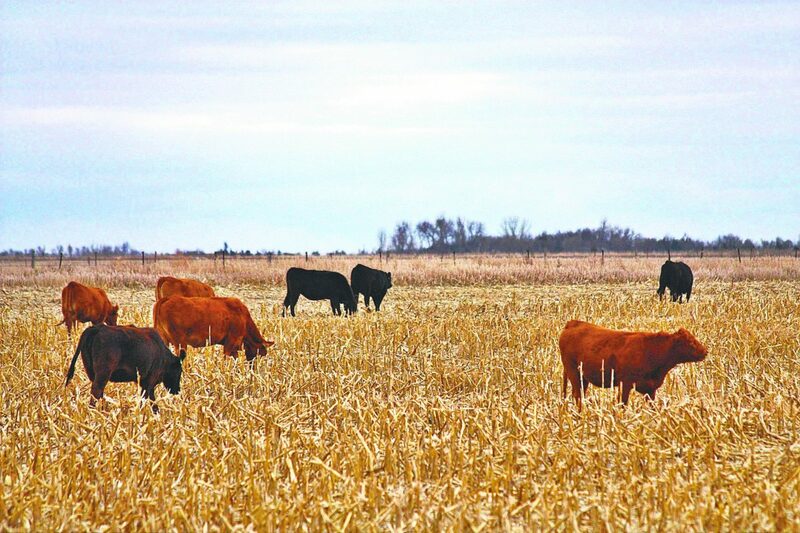 With the extra shot of rain, producers are seeing some regrowth in their pastures and hayfields, but Alexander Smart, South Dakota State University professor of range science, warns producers against the temptation of allowing the herd to graze on some of this new green grass. "Many producers who have been struggling with drought-like conditions over the summer months may be tempted to graze the regrowth they are seeing as a result of these late-season rains," said Smart. "I would caution these producers to exercise caution and to not graze it excessively." While extended grazing on pastures may seem like a short-term solution now as producers put off feeding hay for awhile, it could affect the upcoming spring grazing season. "The problem with overgrazing this time of year is you put the grass in a negative carbohydrate reserve for the following year. It's a catch-22 because if you've been short of forage all summer long, and then you get some regrowth, you think you can extend you grazing period a bit longer. The nutritional content of these new shoots would be excellent compared to the older mature grass, but more producers realize the importance of resting these pastures and are starting to experiment with new ways to extend the grazing season with alternative forages." Doug Sieck is a rancher from Selby, S.D., who also serves on the South Dakota Grassland Coalition. He is passionate about managing the grass by following conservation principles that promote soil health. "I've started planting warm season cover crop mixes of sudan, pearl millet, turnips, radishes, sweet clover, sunflowers, wheat, legumes and cow peas, which I'll turn the cows out on in a few weeks, " said Sieck. "The cows like the cover crops, and it dollars out pretty well. In fact, it's probably the only option that competes with grazing residual crops." Last year, Sieck tracked a field of cover crops that yielded 6,000 pounds/acre. The cattle were moved every three days, and he estimates that the cattle ate approximately 4,000 pounds of forage/acre. "It cost me $150/acre to produce, plus the $2/cow/day to rent the field," he said. "It would cost me $200 to rent pasture for that cow for 100 days, and with cover crops, I can do it for $150, plus the soil benefits stay on the field. If the cows leave 2,000 pounds/acre on the field, the leftover cover crop becomes a cover mulch to prevent the soil from drying out, reducing compaction, and providing good microbes." In a few weeks, corn and soybean harvest will be underway, giving ranchers an opportunity to rent corn stalks for fall grazing. "There will be a lot of grazing opportunities come up in the next three weeks as corn gets harvested," said Sieck. "Corn stalks are so underutilized in the state because farmers are worried about compaction issues or cows removing the residue, and if you want to graze the neighbors' stalks, you need to address these issues." Sieck said grazing cattle on crop residues is highly beneficial to the soil health of the field. "The neat thing with livestock integration on cropland is the livestock become probiotics for the soil," he said. "Any time the cow drops feces, urine, hair or saliva, she is leaving microbes for the soil. However, if a farmer is worried about cow tracks, have a plan in place to address that concern. If it warms up, I'll move the cows out of the field to avoid that issue. It's all about building relationships." Sieck tried something new in his cornfields last season, grazing standing unharvested corn. "Last year, I grazed 30 acres of unharvested corn," he said. "I combined strips and turned the field into a checker board. I gave 200 cows a half acre each day on 120 bushels per acre of corn. Each cow ate 10 pounds of corn and 10 pounds of stalks daily, and I supplemented with alfalfa hay. My total cost was only $1.20/cow." A little patience goes a long way, and for Sieck, using cover crops and corn stalks allows him to rest his pastures until next spring. "I figure if I use residual crops and cover crops, I can let the range rest and maybe get out into the pasture a few weeks earlier in the spring," he said. Chamberlain rancher Larry Wagner also serves on the South Dakota Grassland Coalition and says swath grazing has been an excellent alternative to extending the grazing season. "We manage our grass, so we have forages available as late as possible into the season with our rotation system," said Wagner. "In addition, we do some swath grazing. We cut the grass about the time you would typically bale it to have the most nutritional value, and then we leave it in the windrows for grazing later." Swath grazing is beneficial as it cuts down on labor and expenses of baling hay, and when the herd grazes the windrows in the winter months, they also fertilize the field with manure. However, bale grazing is also an option. Sieck prefers bale grazing and said, "I do bale grazing during the winter where I place 300 bales in a checker board pattern on 15 acres of grass. Then I use poly-wire to give those access to enough hay to last 4-5 days. It works really well, and you don't have to start the tractor as often during the cold winter months." Rotational grazing is a classic conservational practice that both Sieck and Wagner employ in their cow-calf operations. Wagner moves his cows every three to five days through his rotational grazing system. In the fall, he prefers to fence-line wean his calves, so he moves his calves to a pasture with plenty of regrowth providing them ample nutrition. The adjacent pasture houses the cow herd and typically has older, more mature grass on it. "I've found if I set up my rotation this way, the cows are hungry and have to move away from the fence in order to graze, and they are more willing to leave the calf," said Wagner. "Fence-line weaning works really well for us that way, and we plan our rotation for it. Then I typically pull the herd off the pastures completely after the first freeze to allow them to rest and store nutrients for next year." While La Nina weather patterns, which predicted a wet and warm fall, have tempered in recent weeks, producers who are noticing greener pastures this September should start thinking about April before they extend the grazing season. "There are a lot of things happening within the soil as the plants prepare for winter," said Smart. "A lot of programming happens now as far as what the grass will yield in the spring, so consider that as you decide how long to graze this regrowth and if alternative forages might be available to you."